Sometimes even experienced bloggers have a hard time describing what they write about because they just write what’s top-of-mind and then click the Publish button. Even if that’s part of your shtick (say, you’re known for your amazing randomness), you should still have an underlying voice and tone to your writing. For example, you make even the most mundane parts of life sound hysterical. A niche simply means the topic that you write about. In the blogging world, you find two camps: those who believe you must have a niche to be successful, and those who think you can be successful without one. Having a niche can seem more manageable because you have a tighter focus and you don’t have to meet the needs of many different audiences. Because niche blogging really digs into a specific topic, it’s easier to be seen as an expert or a thought leader about your topic. You may also attract more readers because niche blogs can generate more traffic from search engines. Not having a niche might give you more flexibility, though, especially if you’re passionate about more than one topic but lack the time to run multiple blogs. Parent bloggers are a perfect example of this. A mom blogger may share stories about her children, write about family-friendly recipes, share the latest fashion trends, and document a weight loss journey all in one blog. One great example of blogging without a niche is the blog Jenny on the Spot. 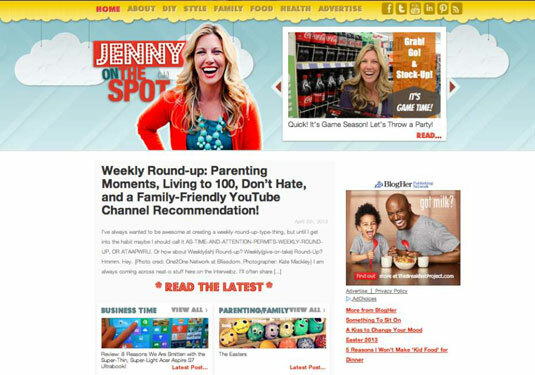 Jenny writes about everything from parenting to style to health. She places some of her blog’s main topics within easy sight in the navigation menu. Then her home page segments her latest blog posts around those topics and more. Even though she writes about many things, her blog design and content tie together. On the other hand, not having a niche can hinder your ability to stand out as an expert or a leader. Without a niche, you may have a harder time branding yourself because you blog design has to encompass the many topics you want to write about. Even if you decide you don’t need a niche for your blog, you still need to establish your voice and tone. Think about your favorite magazine. That magazine may write about many different topics, but one section doesn’t sound like a completely different magazine than another section because the voice and tone are consistent. Voice refers to the distinct personality of your writing. Voice combines attitude, style, and your personal character to give your blog a certain “feel.” If your audience could read two very different articles from you and still know they’re both written by you, then you’ve mastered your voice. What do you want readers to “get” about you through your writing? Voice is an integral part to your brand so by answering these questions, your voice becomes more apparent and defined. Spend some time with these questions because the blog design decisions you make should take your voice into consideration. Readers see your design before they have time to read the content. However, your blog design should feel like your voice. For example, if your writing is sarcastic and dry, your blog shouldn’t be whimsical or flowery. You can also emphasize voice in your blog design by how you actually format your blog posts. Word choice and sentence structure are part of writing but they are visual, too. If you don’t have a niche, really understanding and developing your voice and tone becomes even more critical. Tone is your blog’s mood or attitude. When you write, do you sound snarky, kind, serious, fun, sarcastic, reassuring, helpful, earnest? Your audience doesn’t have the benefit of understanding your words through facial expressions, gestures, or the pitch of your voice. You have just one thing: tone. People often confuse tone with voice, but tone is actually part of your voice. You’ve likely heard the phrase “tone of voice.” While your voice may be humorous, your tone might be sarcastic. The tone of your writing can vary a little from post to post, but your voice should remain consistent. Tone can also vary depending on your target audience or their feelings. Think about how you would share big news with an adult friend versus a child. You’d probably use different words and inflect your voice differently. Or if you were sharing big news with someone who thought might object, you might vary your tone again to keep in mind their feelings. Look over blog posts you’ve written and write down adjectives to describe the overall tone in your writing. Then think about what those adjectives do and don’t mean. No matter what your tone, make sure it’s authentic and doesn’t feel forced. For a really slick look at how a company uses tone to adapt to their audience’s feelings, check out the MailChimp site Voice and Tone.